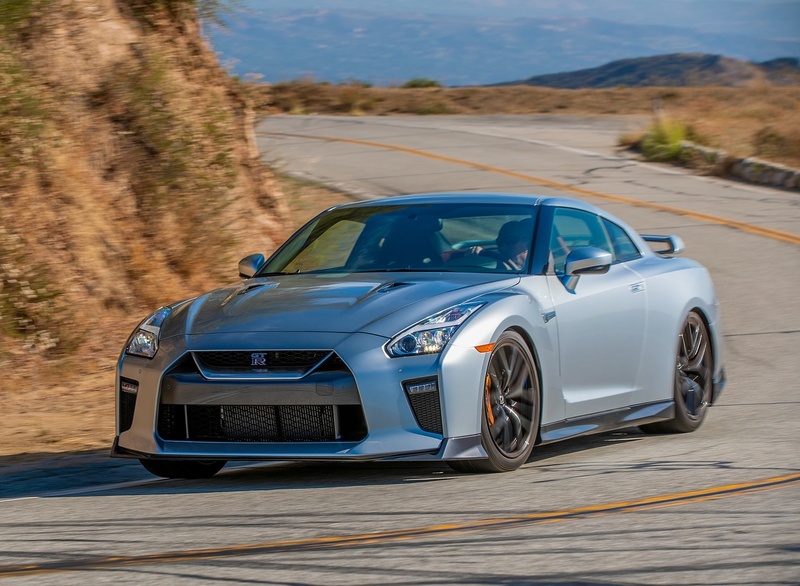 The 2019 Nissan GT-R is offered in four models – GT-R Pure, GT-R Premium, GT-R Track Edition and GT-R NISMO. 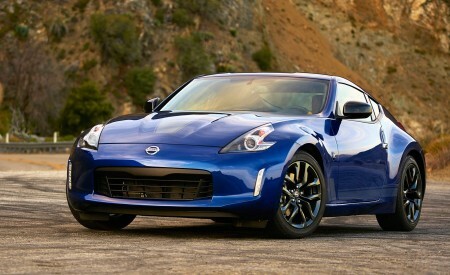 The following information focuses on the GT-R Pure and GT-R Premium grades. The GT-R Pure is designed to be the most affordable of the four followed by the GT-R Premium, which adds an 11-speaker Bose® audio system, Active Noise Cancellation and Active Sound Enhancement systems, and Titanium exhaust system to the long list of GT-R Pure standard equipment. 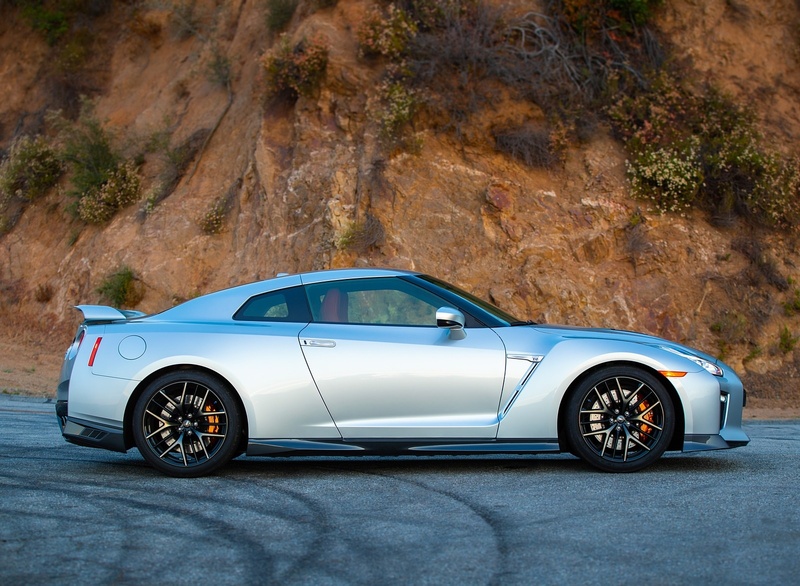 The GT-R’s dynamic styling is both attractive and functional. 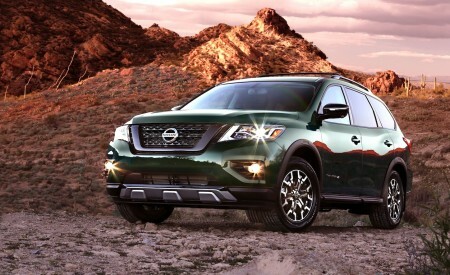 The V-motion grille, one of Nissan’s design signatures, features a matte chrome finish and mesh pattern. The hood, with its pronounced character lines flowing flawlessly from the grille, is reinforced to enhance stability during high speed driving. By essentially eliminating hood deformation, testing has shown that the hood design greatly improves aerodynamic performance at the front of the vehicle at high speeds. 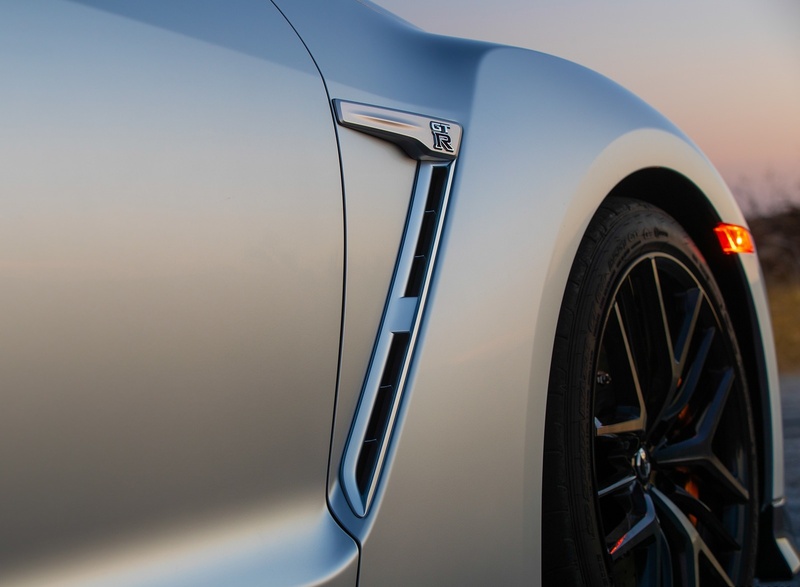 The GT-R’s aerodynamic exterior focuses on three key areas: downforce generation, drag reduction and cooling of vital vehicle systems. The goal is to maximize cooling airflow, while at the same time keeping aerodynamic drag in check – for example, not increasing drag in one area of the vehicle as a result of improving cooling performance/airflow in another. 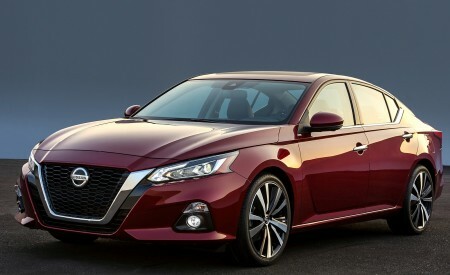 In addition to the grille and hood, the curving profile of the front under spoiler is slightly extended and lowered to maximize airflow at its lower edge. By carefully shaping the sill cover along the lower portions of the sides of the car, the amount of air being drawn underneath is reduced, countering vehicle lift and improving stability. The C-pillars’ upper portions are shaped to deliver better airflow management by preventing the generation of a smaller vortex. 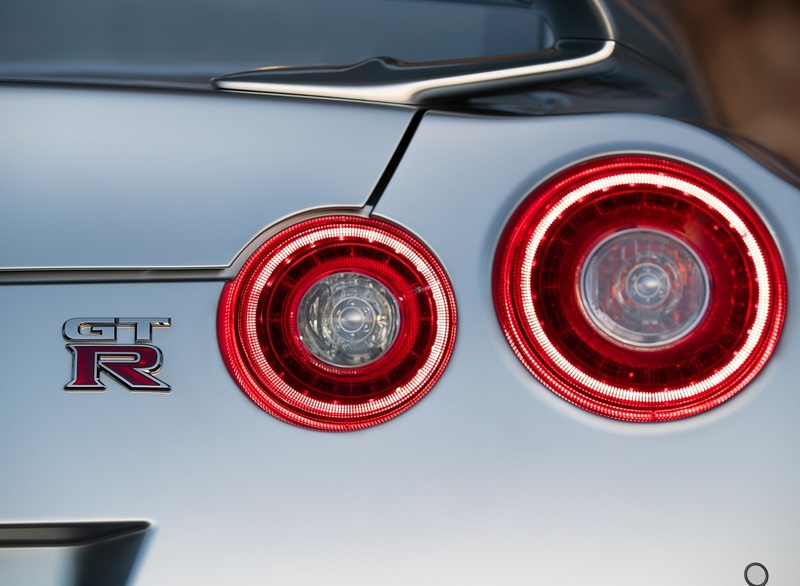 The rear of the GT-R continues to be defined by its iconic round taillights. A silver-finish diffuser and side air vents are incorporated next to the quad titanium exhaust tips to improve the car’s aerodynamics. Also, the character line that separates the lower black section from the body panel is heightened to make the car look wider and more aggressive. The result is an aerodynamically efficient overall exterior with enhanced stability at high speeds, while keeping a 0.26 drag coefficient. The 2019 GT-R Pure is available in three exterior colors: Jet Black Pearl, Gun Metallic and Pearl White TriCoat (premium color). 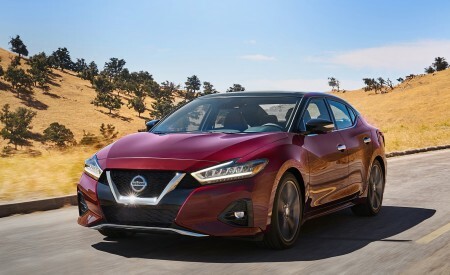 The 2019 GT-R Premium is offered in seven exterior colors: Solid Red, Blaze Metallic QuadCoat (premium color), Jet Black Pearl, Super Silver QuadCoat (premium color), Gun Metallic, Pearl White TriCoat (premium color) and Deep Blue Pearl. The 2019 GT-R’s superbly crafted interior delivers an unparalleled degree of comfort, luxury and everyday usability. Seamlessly wrapped in one continuous hide of the highest quality Nappa leather, the instrument panel adopts a “horizontal flow” to deliver a sense of high stability for the car’s front-seat occupants, while the line from the instrument cluster to the center console provides a distinct driver-oriented environment for those behind the steering wheel. The 8.0-inch touch panel monitor features large icons on the display screen to allow the user to easily manage the audio system, navigation system, telephone controls and other infotainment functions. In keeping with the all-out performance targets for the GT-R, the seats’ layer of cushioned material found beneath the leather is a thin material to help keep overall weight down, while still providing the highest quality of texture. The driver and front passenger seatbacks for the Pure and Premium models are engineered to provide a premium ride experience and ample torso support, resulting in less slippage during spirited driving and reduced fatigue on long commutes. By configuring the support wires within the seatback frame, the engineering team was able to reduce the weight of each seatback while simultaneously reducing pressure points upon the torso of both the driver and front passenger for a more relaxed seating position. Standard on all 2019 GT-R models is NissanConnect® with Navigation and Services featuring Apple CarPlay™, with 8.0-inch color display with multi-touch control, Nissan Voice Recognition for navigation and audio, HD Radio, SiriusXM® Satellite Radio, SiriusXM® Traffic, SiriusXM® Travel Link™ (weather, fuel prices, movie listings, stock info and sports) (SiriusXM® subscription required, sold separately), Bluetooth® Hands-free Phone System, Streaming audio via Bluetooth®, Hands-free Text Messaging Assistant, NissanConnect Mobile Apps and NissanConnect Services Powered by SiriusXM® (SiriusXM® subscription required, sold separately). A Display Command control on the carbon-fiber center console allows easy operation without having to touch the monitor. Other convenient information features include an innovative multi-function meter that allows the driver to customize the layout of important vehicle-specific performance parameters/information, such as coolant temperature, engine oil temperature, engine oil pressure, transmission oil temperature, transmission oil pressure and turbocharger boost pressure. The GT-R’s steering wheel-mounted shift paddles allow drivers to change gears mid-turn without taking their hands off the wheel. 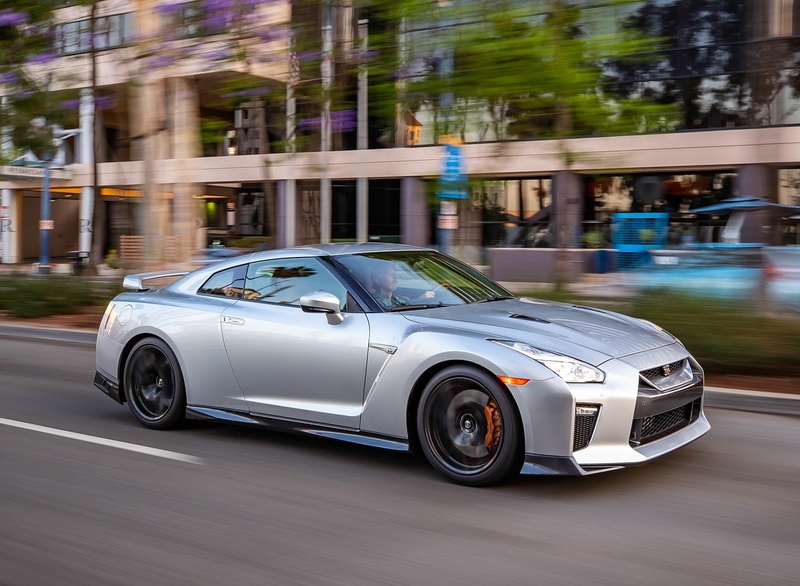 The 2019 GT-R’s 3.8-liter 24-valve twin-turbocharged V6 engine delivers 565 horsepower at 6800 rpm and 467 lb-ft of torque, thanks in part to an ignition-timing system controlled at each individual cylinder – technology utilized on the potent GT-R NISMO. 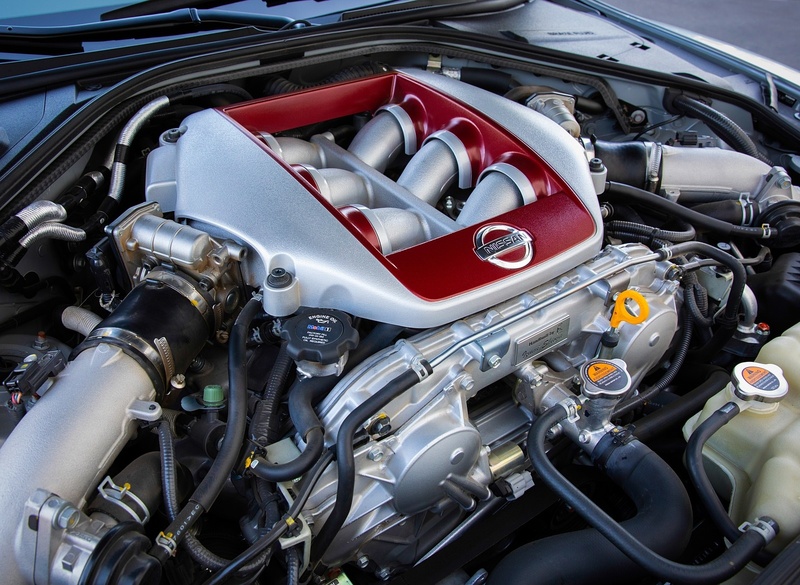 Like with the GT-R NISMO, by more precisely controlling ignition timing at each cylinder, engine knock is significantly reduced while concurrently enhancing environmental performance through a cleaner, more efficient fuel burn. Dubbed the “VR38DETT,” the engine features plasma-sprayed bores (versus cast iron liners) for reduced friction and weight, enhanced cooling, superior power output and increased fuel efficiency. It also boasts a symmetrical independent intake and exhaust manifold system with twin high-performance turbochargers; a secondary air management system for improved cold-start emissions performance; a thermostatically controlled oil-cooling system; an oil scavenger pump to maintain oil flowing to the turbochargers; and a lateral wet and dry sump oiling system. Each engine is hand-assembled from beginning to end in a special clean room by highly skilled technicians. An aluminum plate is added to the front of each engine showing the name of the individual Takumi engine craftsman. 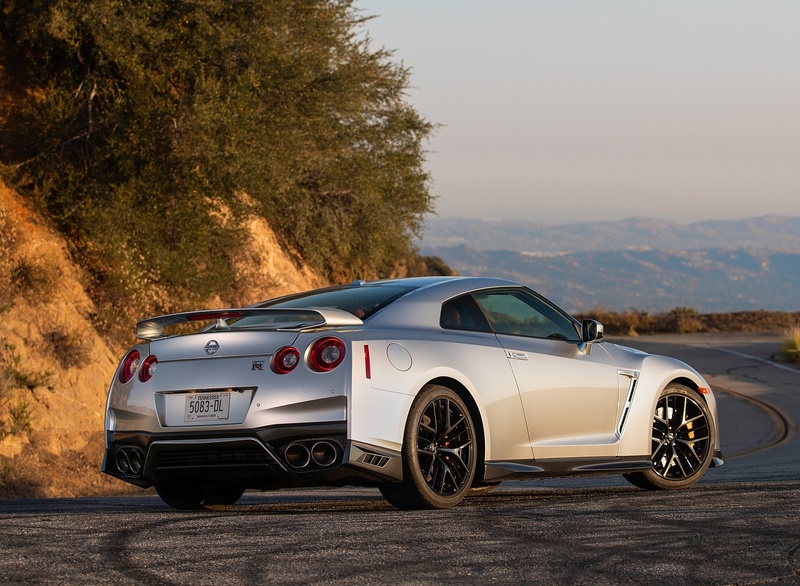 Nissan GT-R Premium, Track Edition and NISMO models feature a titanium exhaust system that better manages the high temperatures of the exhaust gases from the engine. The system includes a duct on the vehicle’s undertray just forward of the muffler, which guides air into the rear diffuser section to help cool the muffler and evacuate hot air. Engine power is transferred to all four of the GT-R’s wheels via an independent rear transaxle, the ATTESA E-TS all-wheel drive system. 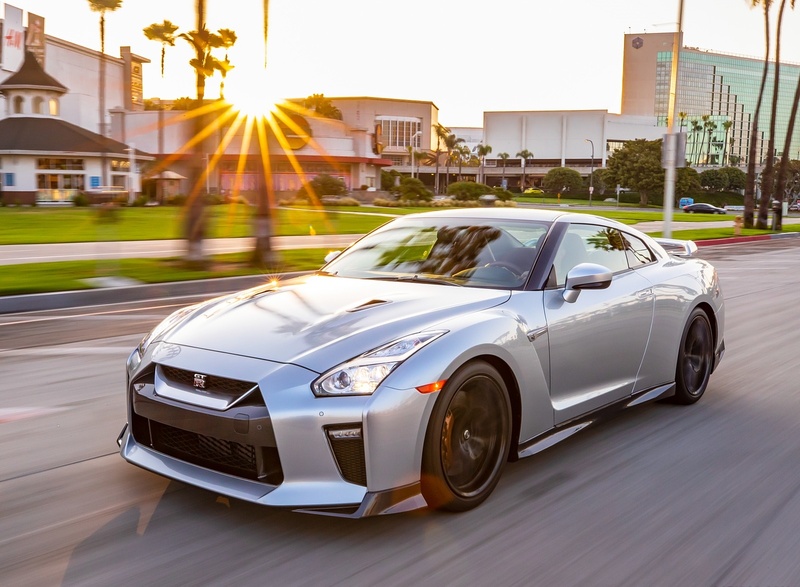 During normal driving, the GT-R behaves like a rear-drive vehicle, with the torque split set at 0:100, but it can be automatically diverted up to 50:50 depending on speed, lateral acceleration, steering angle, tire slip, road surface and yaw rate. A special GT-R-specific yaw-rate feedback control measures the differences between the target yaw rate calculated from the steering angle and actual yaw rate detected by the yaw-rate sensor and G sensor, and adjusts the torque bias accordingly. The transmission shift-management control of the sequential 6-speed dual clutch transmission offers superb refinement and performance in a variety of driving situations. 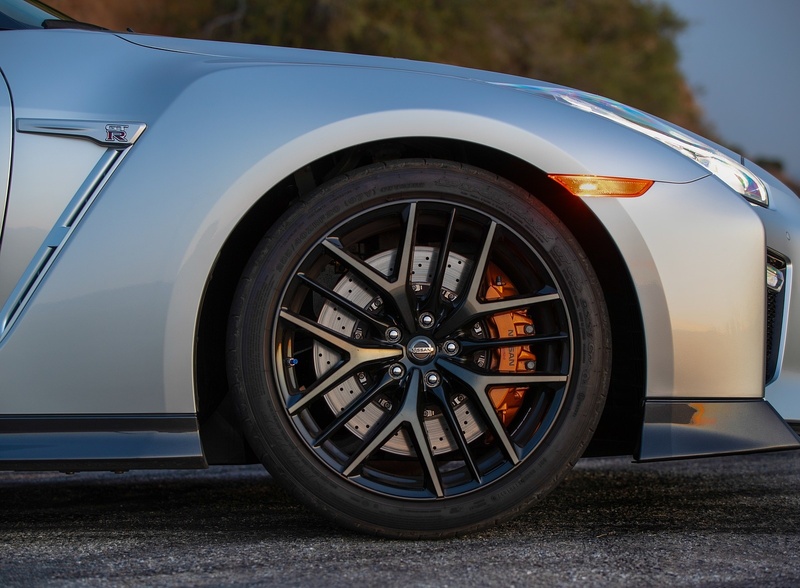 The GT-R’s Premium Midship Platform layout places the transmission, transfer case and final drive at the rear of the vehicle, without the use of traditional torque tubes, allowing the suspension to operate independently while optimizing weight distribution and maximizing tire grip at each corner. 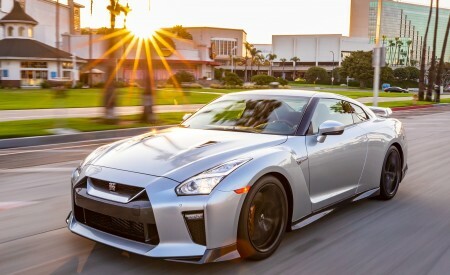 The GT-R’s Bilstein® DampTronic driver-adjustable shock-absorber system – which utilizes information from multiple vehicle systems to provide appropriate damping forces and high level of control for a variety of driving situations – includes a valve housing system that reduces resistance losses. Also, rigid attachment points for the suspension system enhance cornering stability and turning response by allowing all of the wheels to be placed under even a greater load while maintaining optimal contact with the road surface. The DampTronic system features three driver selectable settings: Normal; Comfort, for maximum suspension compliance; or R. The same three-stage adjustability is also available for the VDC system and transmission shift operation. The “R” and “Comfort” settings offer the driver enhanced sportiness and a smoother ride quality. Because of the increase in structural rigidity, the “R” mode enables the vehicle to achieve the same yaw rate with reduced steering angle for a crisper, more communicative steering response, while the “Comfort” suspension setting produces less vertical G-loading in testing when compared to the “Normal” suspension setting. Stylish 20-inch 15-spoke forged alloy wheels by RAYS® offer light weight, strength and rigidity. 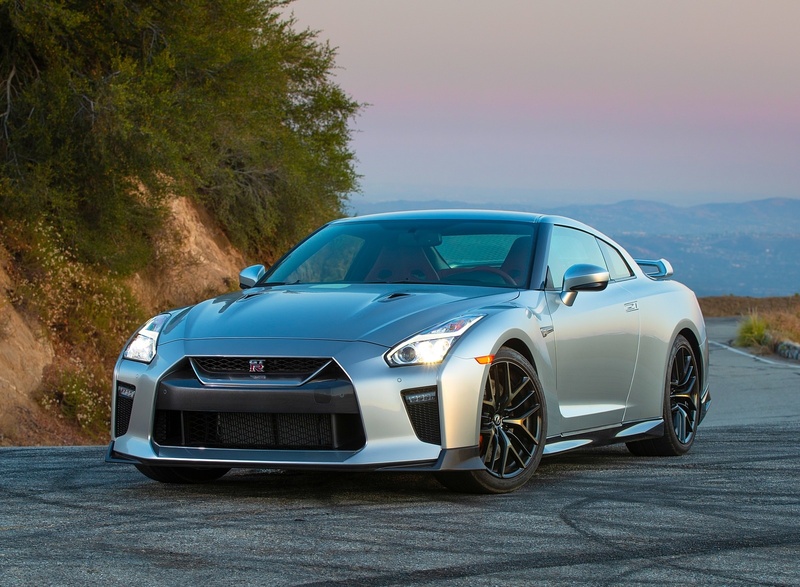 The 2019 GT-R’s steering system – a speed-sensitive power rack-and-pinion design with aluminum steering rack, four-point mounting and stiff insulators – possesses sharp response during spirited driving, with reduced effort for around-the-town commutes and exceptional feedback on the open highway. Stopping power is provided by Brembo® monoblock six-piston front and four-piston rear calipers with 15.35-inch front and 15.0-inch rear Brembo® full-floating, cross-drilled two-piece rotors and low-steel, high-stiffness brake pads that minimize fade and provide intense stopping performance. The calipers utilize race car-style radial mounting to minimize caliper flex during extreme braking. 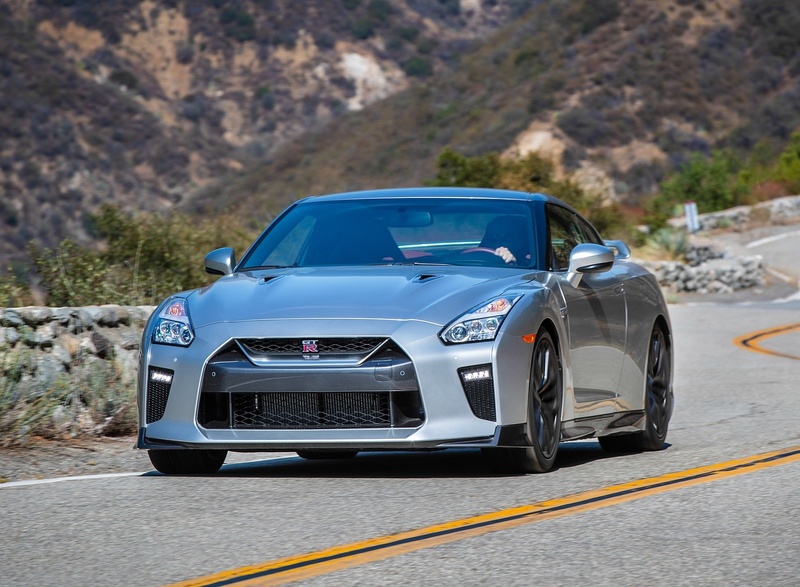 In addition, the 2019 GT-R is designed to invigorate the senses while maintaining a quiet cabin at cruising speeds. The Active Noise Cancellation (ANC) system (not available on the GT-R Pure model) identifies and reduces unwanted low-frequency sounds by using strategically placed microphones within the cabin and using a sound wave at the same amplitude through noise cancellation speakers to offset unwanted sounds. Sound absorption material behind the instrument panel, an acoustic windshield, a dashboard insulator and noise insulators housed within the rear fenders have been engineered to act as countermeasures to remove undesirable noise from both the engine compartment as well as the rear tires. Additionally, the electronic control valve housed within the titanium exhaust helps to control muffler resonance, which could otherwise create an unwanted “booming” sound from the exhaust system; ANC and the exhaust’s electronic control valve essentially eliminate this issue by controlling such unwanted low frequency sound. 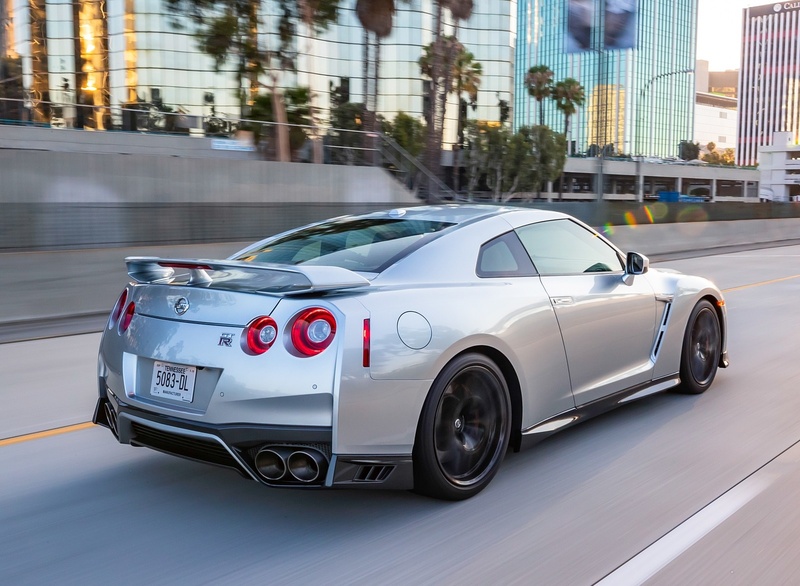 Also, thanks to the fitment of titanium mufflers with an electronic control valve (not available on GT-R Pure), Active Sound Enhancement (ASE) brings the engine’s power directly into the cabin. ASE defines the sound frequency and volume of specific targets (such as the exhaust note) while simultaneously comparing it to pertinent information including engine speed and other key vehicle parameters. It processes the sound signal through the audio system’s amplifier, and then releases it into the passenger compartment through the speakers. 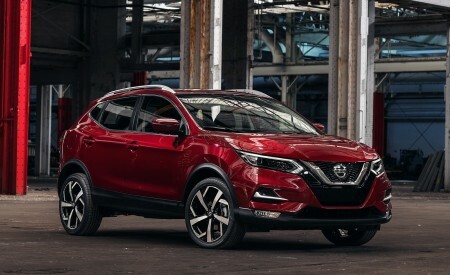 The driver can vary the sound control capability through the different vehicle mode settings – Normal, Comfort and R. Also, an exhaust sound control switch allows for a quieter engine start. By pressing the exhaust sound control switch prior to engine start, this will close the electronic valve within the exhaust system for more quiet operation at engine startup and continue for a brief time while the vehicle is driven with the engine running at low rpms. There is a 10 dB difference between having the electronic valve within the exhaust system closed and opened – a substantial difference in volumetric sound quality to the human ear. Standard safety equipment includes a Nissan Advanced Air Bag System for driver and front passenger, front seat-mounted side-impact supplemental air bags for driver and front-passenger and standard roof-mounted curtain side-impact supplemental air bags for front seat occupant head protection – along with front seat belts with pretensioners and load limiters and three-point ELR/ALR rear seat belts. Other standard safety and convenience technologies include Advanced Vehicle Dynamic Control (VDC) stability control system with three driver-selectable modes (Normal, R-Mode, Off), Electronic Traction Control System (TCS), Anti-Lock Braking System (ABS) and Electronic Brake force Distribution (EBD), RearView Monitor, Tire Pressure Monitoring System (TPMS) and automatic on/off headlights. The 2019 Nissan GT-R is available in Pure, Premium, Track Edition and NISMO models. Two options are available with the Pure and Premium models: an All Weather Package, which includes Dunlop® all-season tires and unique coolant/water ratio; and the Premium Interior Package, with hand-stitched semi-aniline leather “Kuro Night” interior appointments (Premium model only).